Campaigners behind plans to excavate St Piran's oratory at Perranporth in Cornwall say they desperately need more financial help. The St Piran Project wants to uncover the ancient church, which is buried beneath the sands. A bid to the Objective One programme recently for funding for the project was unsuccessful. Thousands of people are set to march across the dunes to the oratory on Sunday to celebrate Cornwall's saint. The ancient church on the dunes near Perranporth is believed to be one of the oldest sites of Christian worship in the British Isles. The secretary of the St Piran Project, Eileen Carter, said the church was a vital part of Cornish heritage. "The oratory is the centre of Cornish culture and heritage and we believe it should be reclaimed for the people of Cornwall. "It is an icon and it's something we have to get excavated and cared for in the future." 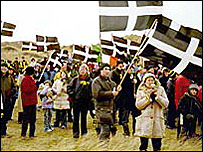 The dunes march is the biggest event of the St Piran-tide calendar. On Friday, hundreds of people marched through the centre of Truro to mark the actual saints day, but more people are expected on Sunday. The procession will makes its way through the dunes, stopping at the Celtic Cross and the oratory. 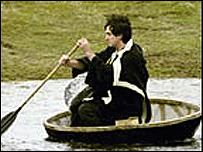 Along the way a three-part play, illustrating the life of St Piran, will be performed. Perran Beach is where St Piran is said to have come ashore in the sixth Century, having made the journey from Ireland in a currach.